Home / Releases / Best Of Susanna Vol.One-Two-Three SPECIAL OFFER! 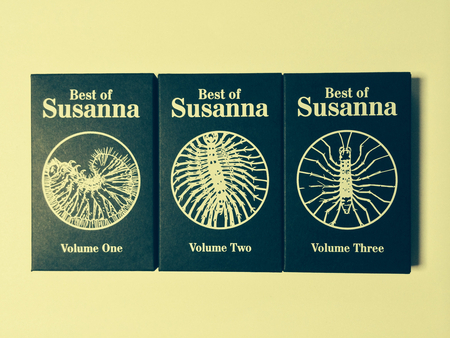 Best Of Susanna Vol.One-Two-Three SPECIAL OFFER! In 2014 Susanna celebrated 10 years as a recording artist, with ten albums released- all of them highly acclaimed. The new technology and digitalized way of listening to music is exciting but also challenging both in the sense of new ways of listening, and how to get paid for making, playing and recording music. Susanna has decided to look back at her releases and also look back at the way she was listening to music when she grew up, though cassettes. SusannaSonata is releasing a Best Of-series with three cassettes, Volume One, Volume Two and Volume Three. The Norwegian noiseartist and cassette-enthusiast Lasse Marhaug has designed the cover for the cassettes, which comes in beautiful black cardboard with white silkprint wrapping. The cassettes are numbered and signed by the artist. There are only 200 of each cassette. The cassettes will be launched at Off The Page, a festival about music arranged by Ny Musikk and The Wire Magazine in Oslo 24th of January 2015.